In todays world, the organizations work in a challenging environment where need of the hour is to implement a collaborative, Omni channel and profitable business with the partners which is win for everyone. The customers today are empowered with access to information through various platforms which enables them to crack the leads and convert them into profitable business. In order to lead in the competitive world, the manufacturers are working towards finding new ways to engage customers early in the sales cycle to ensure seamless business transactions. SAP C/4 HANA enables manufactures to configure lead to quote solution which can maximize the order potential and minimize the lead times in the sales cycle along with better insight into the pipeline and performance. You can also leverage the enhanced capabilities in SAP C/4 HANA Sales cloud with artificial intelligence using SAP Leonardo for various technologies like machine learning, IoT and block chain. Lead management is a process identifying, tracking and managing the prospective customers. With SAP C/4 HANA suit advanced lead management capabilities sales team becomes more efficient as it helps them to create a pool of interested customers and then filters out the qualified leads which can further be converted to opportunities. This also helps the business to understand which tactics brings in the most promising leads which can be used to optimize the sales strategy. The prospects can show interest or enquire about the products through various channels like marketing campaigns, social media, events, blogs, advertisements, white papers and so on. In C/4 HANA you can capture the information about the customers like Customer name, customer address, contact details, customer line of business, customer interests etc which can later be utilized strategically to pitch your products based on customer interests. The customer’s interest can be captured in the lead by entering the products based on customer feedback. You can also add notes/attachments that may facilitate in understanding the customer requirements. You can also specify the mediums through which the contact person for the potential customer can contacted. It also enables you to suggest the channels which can be used to update the customers with the new launches, offers, discount schemes etc through newsletters, email campaigns, online surveys, events and so on. The Sales representatives can access the corresponding transactions like opportunities, quotes and sales orders through document flow from the lead itself from a single screen. The Sales manager can keep a track of the progress on leads assigned to his team and help them out to remove bottlenecks if any. Also it enables to segregate the potential leads which needs to be focused explicitly. SAP C/4 HANA enables the business to structure their communications with the customer by automatically creating the activities like customer visits and surveys using routing rules to ensure that all necessary information is captured which is required to nurture the leads. The information can be captured in the form of texts, attachments, checkboxes, choice of radio buttons or dropdown lists. Moreover, you can also define the ageing criteria for leads in C4 HANA so that the responsible sales manager is notified if the lead stays in a certain stage for the predefined number of days as per the settings maintained for lead ageing duration. The opportunity captures the details of the sales prospect, the products and services they are interested in, competitor details, sales probability, potential sales volume and all other information that is required in course of the sales cycle. Once the lead is qualified, it gets converted into an opportunity. In SAP C/4 HANA you can maintain Sales Cycle which defines the sales process as per your company. Sales cycle is typically broken down to Sales Phases which captures the sales activities carried by the business. You can also define the probability of success or conversion for each sales phase while configuring the sales cycle. All the customer details along with customer interests are copied once the opportunity is created from lead. Products can be added into the opportunity using the product list or product categories. SAP C4C also enables you to have internal or external pricing set in the opportunities. With the new release for SAP C/4 HANA 1808 you can also recommend products derived by product list and optional via Machine learning as a combined list. You can also maintain the competitor details in the opportunity which enables you to strategies your sales. SAP C/4 HANA provides you with Activity advisor which is very useful to Sales Representatives in suggesting the activities for the open opportunities which strengthens their probability for sales win. Buying Centre in an opportunity helps to identify the roles and people who have key influence in decision making during the sales cycle. It basically displays the relationship network of key decision makers for customer capturing key attributes for each individual. 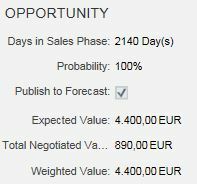 Forecast feature in opportunity enables it to be considered in the forecast whenever sales forecast is run. Quote is one of the most important transaction in sales cycle as it captures the details of the products and services offered to the customer/prospect capturing the pricing details along with other related terms and conditions. The customer can review the quote and can decide if he would like to proceed with the purchasing the offered products or service. SAP C/4 HANA enables the sales representatives to present the quotes quickly to the customers in both online and offline modes (offline in case of hand held devices) with accurate pricing. Sales Quote can be created as a follow up to the opportunity, directly from the customer master screen or it can also be created from Sales work center using sales view. You can introduce the upselling/downselling based on the product entered in the sales quote. You can also recommend or cross sell the products through sales quote based on the products added to the recommendation work center by the administrator. You have the feature of product exclusion and product restriction to control the product offerings to the customers. You can restrict certain customers to specific products only being offered in the sales quote using product restriction feature while product exclusion feature restricts certain products to specific customers. SAP C/4 HANA supports both internal as well as external pricing with integration to ERP system. With internal pricing you can define the price list, discounts, freight charges and surcharge on the products offered. It also handles the currency conversion in case the document pricing currency is different than currency of pricing master data. In case of external pricing, the pricing details are called from the source ERP system and other information like credit check and ATP check can also be called along from the external source system if they are set in the scoping by the administrator. You can also leverage automated streamlined approval process in SAP C/4 HANA which helps in protecting the profit margins while negotiating the customers. The workflows can be set for quotes with exceeding discounts or with some nonstandard terms demanded by customers. You can define the multi level approval steps with different approvers and conditions. The system checks each step and post approval, the notification is sent to the successive approvers work center requesting his review for the quote. The approver can review and approve or can return the quote back to the employee with his comments. You can also have the email notifications sent to approvers when they receive quotes for their approval.